Inclusive education means that all children - no matter who they are - can learn together in the same school. This entails reaching out to all learners and removing all barriers that could limit participation and achievement. Disability is one of the main causes of exclusion; however, there are also other social, institutional, physical, and attitudinal barriers to inclusive education. Inclusive education systems, which is a core part of the fourth Sustainable Development Goal (SDG4) and the 2030 Education Agenda, respect the diverse needs, abilities, and characteristics of all children and youth, and is free of all forms of discrimination. Inclusive education systems can in turn foster societies that are more inclusive. Read more about the urgent need to plan for inclusion in education in our recent opinion piece published by Devex! 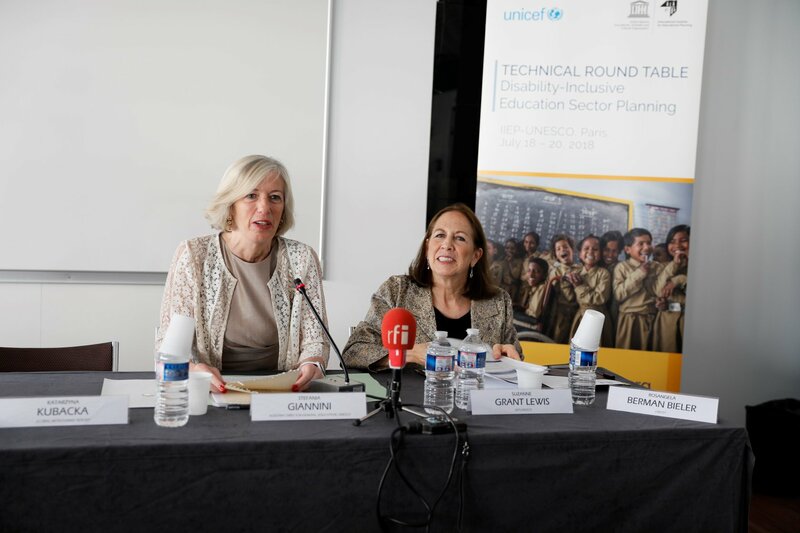 To help advance disability-inclusive educational planning, IIEP-UNESCO convened a technical Round Table in July 2018 together with UNICEF for key government actors, development partners, and Disabled Person’s Organizations from eight countries. The countries - Cambodia, Ethiopia, Fiji, Ghana, Kenya, Nepal, South Africa, and Viet Nam - were invited because of their strong contributions to inclusive education. Webcasts of the plenary sessions are also available to watch here. IIEP is currently developing a training course in planning for inclusive education, in partnership with UNICEF. This will start with a distance education course, currently scheduled to start in September 2019. Beginning with a focus on Anglophone Africa (the course will later be held in French and for additional regions), will primarily target ministry of education staff. IIEP-Pôle de Dakar is also working with UNICEF, the Global Partnership for Education, and the World Bank, on a third volume of the Education Sector Analysis Guidelines, which includes guidance on inclusive education. Follow #Plan4Inclusion on Twitter for updates and more information.